Summary: Before: When Bridget imagined her life at sixteen, it didn’t look like this. She didn’t think that her boyfriend would dump her for another girl. And she certainly didn’t think that she would be pregnant. With just a few months until she gives birth, Bridget must envision an entirely new future—one for her baby. But as she sifts through the many paths and the many people who want to parent her child, she can’t help but feel that there is no right decision. After: Ivy doesn’t know much about her birth mother. She knows that she is now the same age Bridget was when she placed Ivy for adoption. She knows that Bridget was the one who named her. And she knows that fifteen years ago Bridget disappeared from Ivy’s and her adoptive moms’ lives. Ivy wants to discover more about herself, but as she goes to find Bridget, she can’t help but feel that the risks might far outweigh the benefits of knowing where she comes from and why her birth mother chose to walk away. 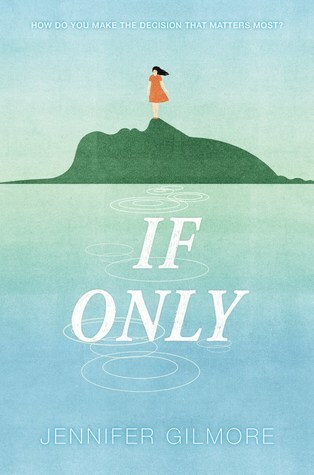 I received an ARC of If Only from author Jennifer Gilmore in exchange for an honest review, and I'm really glad that I did -- I absolutely loved this book! It had me laughing, crying, and everything in between from start to finish. This is a heartwarming story of love, belonging, and even a strong sense of loss. This book certainly takes you on an emotional rollercoaster, and it does it in all the best ways. As the summary explains, sixteen-year old Bridget finds herself pregnant and unsure of what to do, and she eventually makes the decision to put her daughter up for adoption. So the first half of the book takes you through Bridget's heartbreak, confusion, and struggle when figuring out what to do and trying to find the perfect family for her daughter. And then the reader is taken into Ivy's perspective, sixteen years later -- the same age that her mother Bridget was when she put her up for adoption. Ivy, having never really known her birth mother at all, has a desire to know more about her, and maybe even meet her -- which would've been easy if it wasn't for the fact that Bridget completely dropped off the map. So this book takes you through both Bridget and Ivy's struggles, as well as the struggles of several other characters in the book. (Which I'll talk more about in a little bit.) It's a really emotional, complicated, heartbreaking journey that this book takes you through, that's for sure. My favorite part of this book was definitely the contemplation of the "if only" scenarios. The book explores several chapters contemplating what Ivy's life would have been like if she had been given to a different set of adoptive parents. It was really interesting to see how many things would be different in those scenarios, and even things that may have stayed the same. There were also a few little cross-references that you had to look out for but made you smile when you found them, like the piano man being ticketed in Washington Square Park appearing in an "if only" scene and also Ivy's present-day life. I just thought that it was really unique and interesting to contemplate what things would be different if Bridget had told differently -- but not in a simple little passing thought. There were entire scenes/chapters dedicated to these "if only" scenes, which I think was incredibly creative, unique, and kept me hooked onto the story from start to finish. I also really loved the wide array of perspectives that this book covered! In addition to the chapters contemplating Ivy's potential alternate lives, there were multiple perspectives that were explored throughout this book. Of course, there was Ivy and there was Bridget, but there were also Ivy's adoptive parents, and even another mother who gave a child up for adoption, but I'll refrain from talking more about that chapter at the risk of spoiling it -- but I can definitely tell you that it caught me off guard and I really appreciated it! (Minor spoilers in this paragraph, so please skip this paragraph if you don't want the book spoiled for you!) The only thing I wished I had more of was an ending -- I wanted to find out exactly what happened when Ivy spoke to Bridget (and if she recognized her), especially if she came all the way to New York just to see her. I know that it was totally an artistic choice not to reveal the actual conversation, so it wasn't an issue of the writing at all, I'm just super nosy and wanted to know because that was something I was really excited to read. But I think that the way the book left off was certainly fitting, I just loved this story so much that I was sad to see it end! Overall, I absolutely loved If Only. This book took me on an emotional rollercoaster and showed me a side of adoption that I had never considered before -- the struggles and the wondering and all of the things that someone can spend so much of their life not knowing the answers to. And, of course, how one decision can impact everything -- and it contemplates what would happen if you chose differently. Hats off to If Only -- if this book isn't on your TBR already, it definitely should be! I hadn't heard of this book, but it sounds amazing! I'll definitely have to check this out now.